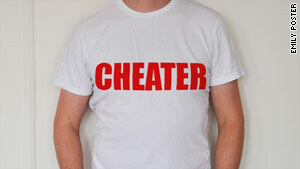 Men who cheat do it because they are unhappy with their life, not their wife's appearance, columnist says. You know what this girl had the audacity to say to me? "I've seen a picture of you! No wonder he cheated." Owww. Sadly, that dopey logic is not confined to teenage soccer players who give hickeys to other girls' boyfriends; it has cycled over and over and over in my mind as this alleged Tiger Woods affair has played out. Surely you, like me, have heard numerous friends or significant others say something to the effect of, "How could he have cheated on his wife? She's so gorgeous!" Yes, Elin Nordegren is a blonde-haired Swedish former model and her turd husband allegedly still cheated on her. What I want to know is why we insist a woman's beauty -- which is highly subjective! -- is some kind of barometer -- which is highly shallow! -- of whether or not her hubby will cheat. Let's get this clear: People cheat because they are unhappy in their relationships. That's it. I'm not naive: I know plenty of people cheat because their paramours have gained weight/lost too much weight and said paramours are no longer an object of physical attraction. But it's an underlying and relatively shallow factor, not cause-and-effect at all. Most relationships have these little things called "love," "trust" and "respect"; relationships that have all those things don't have cheating. If you really, really love someone, you will deal with the inevitable aging process. The implication is that Nordegren is too pretty to cheat on and that Tiger's infidelity would make more sense if she were ugly -- but since she's beautiful, there must be something else she did that drove him to do something so insane. Let's stop insinuating that when a man cheats, it is always because of something the wife did (or didn't do). And that's especially true when we're talking about somebody like Tiger Woods, who appears to have allegedly cheated with a bunch of random cocktail waitresses all over the country. None of them appear to be love matches. Furthermore, Tiger Woods has plenty of coin to hire a divorce lawyer. If he was/is really unhappy in his marriage to Elin Nordegren, I'm sure plenty of attorneys would jump at the chance to handle his breakup for him. Cheating, as they say, is the coward's way out. At the end of the day, it is Tiger who allegedly cheated. It is Tiger who allegedly tried to cover up the mobile phone trail. It's Tiger who is at fault, not his beautiful wife.